If you really want your stomach muscles to burn during your stomach workout, then try this killer stability ball stomach toning exercise. Stability ball reverse crunches will make your stomach burn like no other exercise. 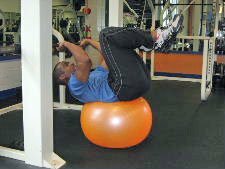 Reverse crunches on the stability ball are a really advanced stomach exercise. If you are a beginner, you should not attempt this exercise. First, build up your strength with regular reverse crunches on the floor. Then, progress to reverse crunches on a decline board, and when you've mastered decline reverse crunches, then try this variation of reverse crunches. 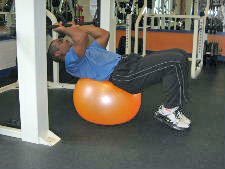 Because the stability ball is unstable, the muscles in your stomach will have to work extra hard just to keep your body stable. Starting Position: Lie on a stability ball and secure your upper body. Form: Exhale and bring your knees up towards your chest. Hold for a brief second and then slowly lower to the starting position. Personal Trainer Tips: You must pay attention to your lower back during this exercise. When your lower back arches excessively, extra pressure is placed on the joints of the lower back. To really get the most out of this exercise focus on the lowering portion of the exercise. The further you lower your feet towards the floor, the harder your stomach muscles will work. If this exercise is too challenging, start by simply practicing staying in the dead bug position on the stability ball. It can be challenging to keep your balance during this exercise, so move in a slow and controlled manner. Aim for 3-5 reps the first few times you attempt this exercise and try to biuld up to 15 repetitions. Or See the List of all Exercises for your Stomach Muscles.